of mouth in the context of purchasing counterfeit products. followed by a presentation of the results of the investigation. brand value (Lai & Zaichkowsky, 1999). 1988). The quality of counterfeits varies according to product. counterfeiting focused on above mentioned factors. als and endorsements desired by the company are uttered. and in securing the decision to try the product (Sheth, 1971). quality expectation (Webster, 1991; Zeithaml et al., 1993). significant role, still no attempts have been taken in this field. in the society one must feel comfortable of using the products. value to the counterfeiting firms. 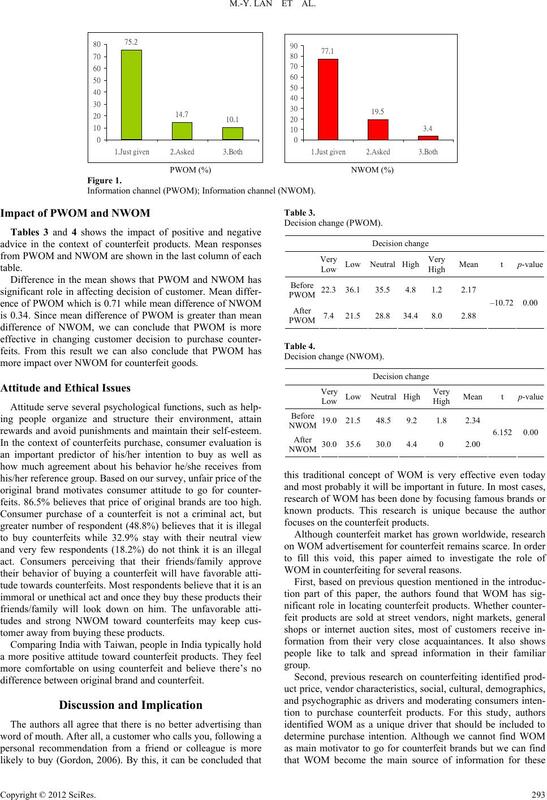 the impact of PWOM and NWOM in the context. matically based on people culture, income level and society. research and followed by a discussion of findings. bag (for Taiwan) is used as a product category for this study. be a product that consumers buy after some thoughts. WOM has any significant role in locating counterfeit products. opinion and select reasons behind buying counterfeit products. attitude and purchase of counterfeit after receiving WOM. statistically significant if the two-tailed P value was <0.05. the place because they had heard it from their friends or family. Sources of information in f inding location. social-adjustive function rather than value-expressive function. counterfeit products are shown with their mean in Table 2. 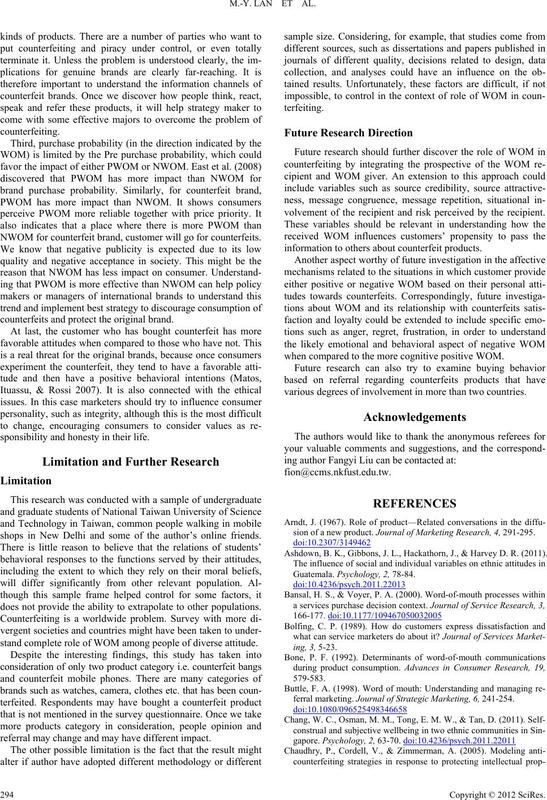 Information channel (PWOM); Information channel (NWOM). more impact over NWOM for counterfeit goods. rewards and avoid punishments and maintain their self-esteem. feits. 86.5% believes that price of original brands are too high. tomer away from buying these products. difference between original brand and counterfeit. focuses on the counterfeit products. WOM in counterfeiting for several reasons. NWOM for counterfeit brand, customer will go for counterfeits. counterfeits and protect the original brand. sponsibility and h o n e s ty in their life. shops in New Delhi and some of the author’s online friends. does not provide the ability to extrapolate to other populations. stand complete role of WOM among people of diverse attitude. referral may change and may have different impact. volvement of the recipient and risk perceived by the recipient. information to others about counterfeit products. when compared to the more cognitive positive WOM. various degrees of involvement in more than two countries. sion of a new product. Journal o f Marketing Research, 4, 291-295. Ashdown, B. K., Gibbons, J. L., Hackathorn, J., & Harvey D. R. (2011). ferral marketing. Journal of Strategic Marke ting, 6, 241-254.
erty rights in a global environment. Marketing Review , 5, 59-72.
determinants. 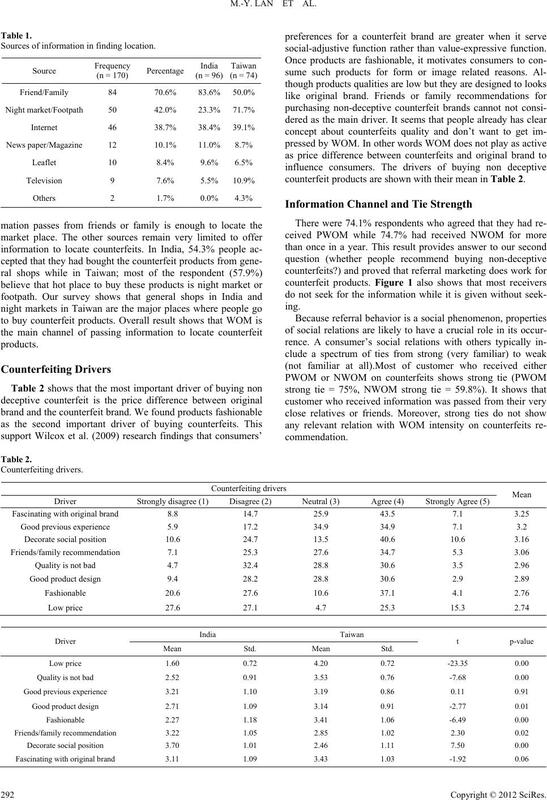 Jou rnal of Busin ess Research, 35, 41-53.
positive and negative word of mouth on brand purchase probability. 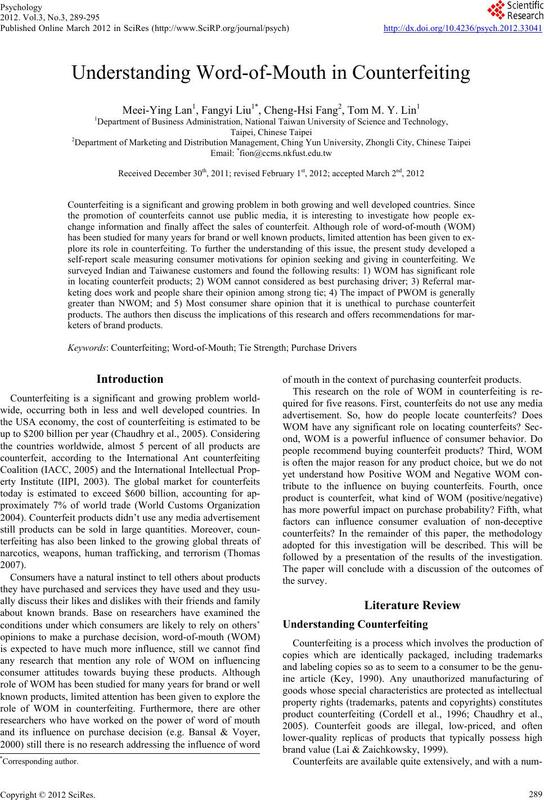 International Journal of Research in Marketing, 25, 215-224.
communication by the innovator. 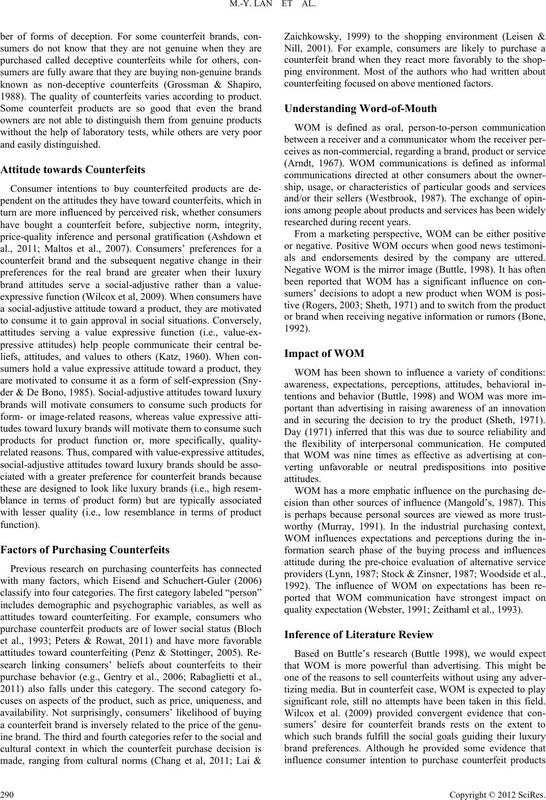 Journal of Marketing, 33, 15-19.
word of mouth communication. Marketing Science, 23, 545-560. Gombeski, W. R., Fay, G. W, Niedzielski, K. R., & Weaver, F. J. (1988). nization. Journal of Business Research, 17, 81-90.
goods. Quarterly Journal of Economics, 103, 79-100. Grossman, G. M., & Shapiro C. (1988). Counterfeit—Product trade. American Economic Review, 78, 59-75.
contrast effects in reactions to communication and attitude change. Journal of Abnormal and Social Psychology, 55, 244-25 2. Katz, D. (1960). The functional approach to the study of attitudes. Kay, H. (1990). Fake’s progress. 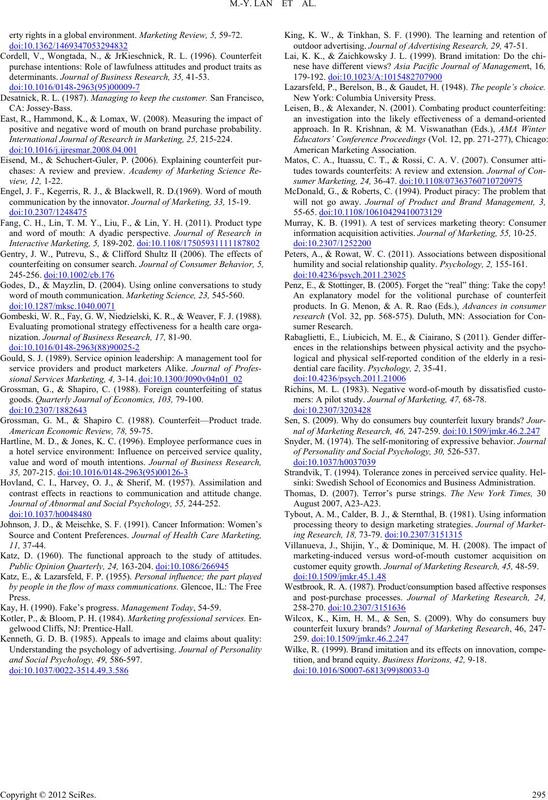 Management Today, 54 -59.
and Social Psychology, 49, 586-597.
outdoor advertising. Jou rn al o f Advertising Research, 29, 47-51. Lazarsfeld, P., Berelson, B., & Gaudet, H. (1948). The people’s choice. information acq u i si t io n ac t i vi t ie s . Journal of Marketing, 55, 10-25.
humility and social relationship quali ty. Psychology, 2, 155-161. Penz, E., & Stottinger, B. (2005). Forget the “real” thing: Take the copy! dential care facility. Psychology, 2, 35-41.
mers: A pilot study. Journal of Marketing, 47, 68-78.
of Personality and Social Ps y c h o l o g y , 30, 526-537.
sinki: Swedish School of Economics and Business Administration. customer equity growth. Journal of Marketing Res ear ch, 45, 48-59.
tition, and brand equity. Business Horizons, 42, 9-18.